Normally I balk when XC mountain bike races have the women doing the same distance as the men. But my opinion is starting to change a little bit. Yes it might take a little longer to finish, but that certainly doesn’t mean women can’t go the same distance. And in fact this past race we did – and you know what, Beverly, Melinda, and myself crushed it – way to go ladies! The women’s distance is normally less, because cross country races are based on a suggested finishing times between 1:30-1:45 , not on distance. If we go the same distance as the men, our times start to mirror more of an endurance mountain bike race instead of a cross country race. And while I’d prefer a xc distance when I sign up for an xc race, it was a nice chance to prove just how strong we are, that we can compete at the same distance as men. My opinion started to change after reading about Evelyn Steven’s successful attempt at putting together a 17 stage road race to prove that women are capable of competing in a grand tour like the men (a la Tour de France). None exist for the women (the rules actually prevent it) so she strung together a couple of smaller tours to simulate a grand tour – and she killed it! Because of what she accomplished, I went into the race thinking "I can do this" instead of "wtf - this is too long". I was a little worried about some the technical areas of the course with tall logs across the course and plenty of exposed roots, but at least I wasn’t panicked about the distance! And I actually felt the best I've felt all season during a race, even when I crossed the finish line after 2 hours and 9 minutes of racing. Usually there is some point where I have to remind myself to push through the exhaustion and keep racing - I didn't have to remind myself to keep going hard this time, I just did. Cycling has come a long way for women, but it still has a long way to go as was evident as this race. It was pretty disappointing to see so few women lining up to compete. 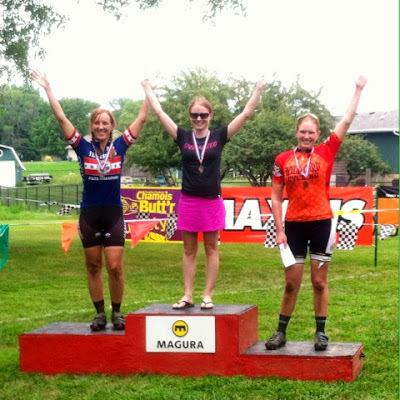 Illinois has an excellent mountain bike series and I just don't understand why there aren't more women that show up. The race promoters and volunteers really know how to put on a well-organized race and they are friendly beyond belief. The courses are always super fun with different challenges sprinkled in to keep things interesting. And while challenging they are some of the most fun races I’ve done. I wish there was an easy way to get more women out there! If only I could find a solution to that and my fear of going over tall logs. I see a skills clinic in my future!